Ask yourself: Do you teach for the Journey or the Outcome? So much teaching in other subject areas is concerned with heading towards a target or learning outcome. When teaching art, AccessArt would encourage teachers NOT to teach towards a target or outcome, but instead to facilitate the journey and to concentrate instead on the creative exploration itself. This post shares thoughts about why we might favour facilitating the journey, practical ways to do so, and how investing in a meaningful journey will ultimatley help create great outcomes as matter of course. A teacher repeats a previous session because they are confident it will produce an “effective” visual outcome. A teacher stays within their comfort zone of personal experience. They decide to control the outcome as they lack the confidence to let the children go off track. A teacher is pressured to produce a display and they feel they can control that if they work backwards from a visual outcome. What does art look like when it is created as a result of teaching towards an outcome. It can carry the aesthetic favoured by the teacher. It can result in a class of artwork which look similar. It can often be based upon creating pastiches. It can feel safe or predictable. It can feel like the pupils don’t own the artwork. Teaching towards a predefined or pre-visualised “end result”, is often understandable. Whether it’s a display in a school, work for an assessment, images for a resource, or drawings produced in a workshop, we all want to see (and show we have produced), great work. We want everyone to look their best – everyone to be seen as being capable of doing their best, and more often than not we make this judgement based upon the end result. And yet work created in this manner is often not the most exciting, and sometimes a “great” outcome can hide a less than exciting journey, where few risks are taken, and little genuine understanding or experience has been built. Conversly, we have to recognise that sometimes, a session that has enabled the children to learn lots, might result in work that is, quite literally, hard work to reflect upon. 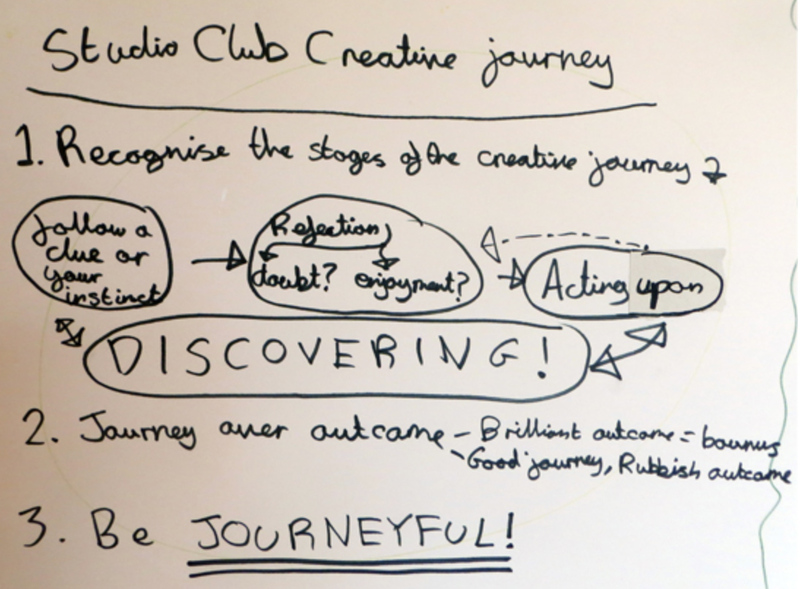 If a workshop session produces what looks like scribbles, which are in fact part of a journey, how does the onlooker value those scribbles? (see more about playing safe and taking risks). Perhaps we have to acknowledge that sometimes, only those who took the journey will be able to truly appreciate the experience. What does teaching for the journey look like? If we create the time and space for the journey to be rich and varied, there is a greater chance the journey will feel owned by the pupil. If the journey is owned by the pupil, it will be meaningful and relevant. That great journeys can, over time, lead to outstanding, inspirational outcomes. Here are some suggestions as to how you can begin to teach for the journey, not the outcome. They are in no particular order, and will not all resonate with everyone! Purposely avoid having a clear outcome in mind. Try to feel comfortable with NOT knowing where you are heading in terms of finished pieces. Avoid projects which create pastiches of great artists work. Those great artists had their journey, but a child exploring the things which interested that artist will not naturally come up with the same outcome if they are allowed their own journey (unless you force them). Try not to confuse art appreciation with studio practice. Take risks yourself as teacher. Think in terms of “challenges”. Challenge your pupils through materials, techniques, explorations. Be wary of using too many, or too guided, demonstrations, or showing too many images of an end result. Don’t guide children “towards” an end result which is in your head, or which you have seen someone else create. Instead use materials, techniques and explorations as points from which to “spring off”. Empower children by talking to them about how they will each created their own artwork, reflective of their own journey. Model an exploratory approach. Feel comfortable when facilitating art sessions with letting the pupils see you are on your own journey too. Talk about the journey. Ask children to share what they have discovered along the way. Build in lots of time for reflection (at all stages). Enable children to articulate their experience. Celebrate getting “lost”! Have the confidence to celebrate times when children diverge from “your plan”. These might be the moments when learning becomes owned. Introduce the idea of a “journeyful” wall or approach. Post up work (all stages) which celebrates and supports this ethos. Think about displays as being about the journey. Assess the journey and intention rather than concentrate on the outcome. (If indeed you must assess at all). Remember creativity is the most fragile beast. Confidence can be knocked very easily (and for a lifetime). Question if you as teacher really understand the intention or experience of the journey, or have you misunderstood? Recognise that different children will have different styles. Some will be messy, some will be neat. As in adult life, there is space for lots of different types of creativity. Embrace the use of sketchbooks – the perfect journeyful tool! Split the session into a series of smaller outcomes and allow children to move away into their own journey at every opportunity. AccessArt has over 25 years experience of teaching art in schools and this post is written from our perspective. Please comment if you would like to lend your view. This is a sample of a resource created by UK Charity AccessArt. We have over 750 resources to help develop and inspire your creative thinking, practice and teaching. AccessArt welcomes artists, educators, teachers and parents both in the UK and overseas. 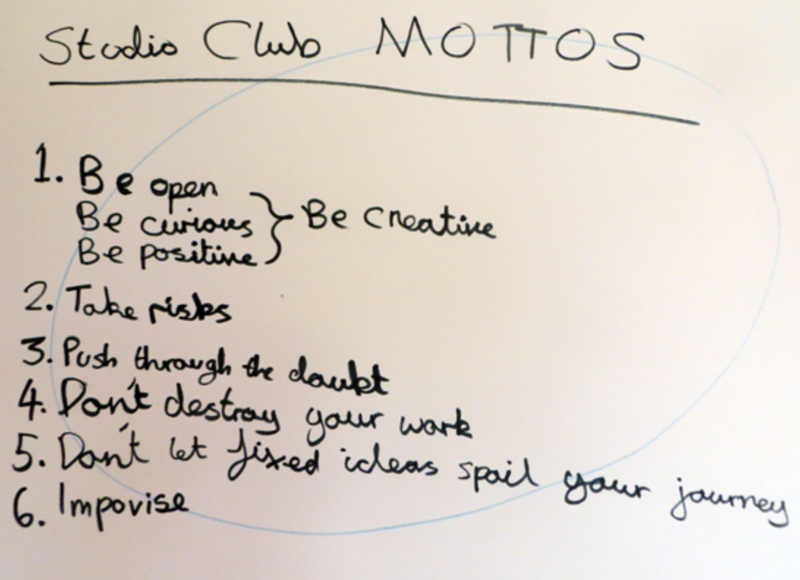 We believe everyone has the right to be creative and by working together and sharing ideas we can enable everyone to reach their creative potential. Join AccessArt from only £3.50 per month and enjoy full access to hundreds more resources! Go to your Account Forgotten Password? What We Are Working On! AccessArt and the #BeACreativeProducer team will be working to create a short film called "Through our Hands" as part of InSEA and International Art Week. Teenagers work with David Parr House, Cambridge to create resources to inspire primary-age children. AccessArt is excited to be working with Paul Carney to create 5 posts which enable teachers of both art and science to approach drawing from a new perspective. A brand new initiative to help celebrate the creative potential of teenagers, giving them the opportunity to develop their creative skills and contribute to AccessArt. New to AccessArt? Start Here!